The Image L80 LED story begins in 1995 when visual effects cinematographer Mark Weingartner, working on a 200ft/60M greenscreen stage for Under Siege II, Dark Territory, asked Kino Flo Lighting Systems to design an energy efficient, high output panel array capable of hitting the maximum lux points without sacrificing soft, supergreen color density essential for travelling matte photography. The Kino Flo Image Series was born! The light changed the way Hollywood has made movies ever since. Years of advanced chemistry and software design research have served as the foundation for a new generation of Kino Flo Lighting’s Image L80 LED fixtures, endowed with superior white light (>96 PRI/98 TLCI) and boasting a full hue and saturation gamut, including the company’s own supergreen and superblue visual effects colors. The versatile Image L80’s come with yoke mount options for studio grid installations and variable beam pitch control to ensure an even flow of illumination from the top of a cyc wall (as high as 60 feet/20 meters) all the way out to stage forward. The downfacing panels are as bright as tungsten spacelights, and the True Match® firmware ensures more dynamic light control than other LED spacelights. Kino Flo Lighting’s Image L80 photometrics and control specifications are available online for download into pre-visual studio design programs and professional lighting console profiles. The Image L80 LED DMX operates on universal AC power and needs only 4A (120VAC) to produce more lumens than a 1k tungsten softlight. The Images cost savings from low energy and long lamp life continues Kino Flo’s reputation as an environmentally friendly lighting company. Rated lifetime is up to 50,000 hours. With its long LED life, the Image LED's unique design maintains its color-correct color temperature. As with all Kino Flo products, the Image L80 LED has been specially formulated to match the spectral distribution curves of today’s HD film and video equipment. The Image L80 LED has a high color rendering index of CRI 95. Even while dimming, the fixture is flicker-free and without color shift. For Kino Flo, heat management is a critical design element of fixture design. The physical heat or buildup heat within the LED fixture will directly influence the color temperature, lumen performance and life of the LED. 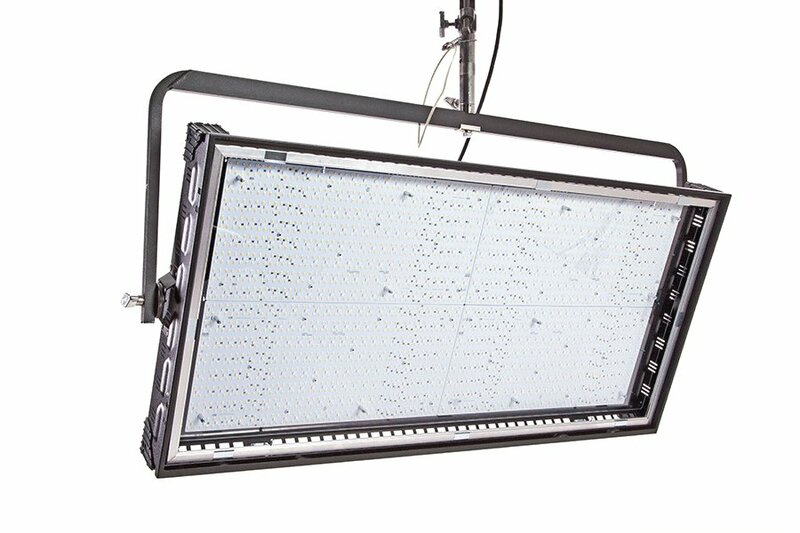 The Image L80's unique design operates coolly, consumes very low energy (4A, 120VAC) and is properly ventilated to maintain a stable color temperature. A well maintained temperature extends the lumen maintenance, color temperature and life of the LED. Any light generates a percentage of usable light and the rest in heat. For example, a standard incandescent light bulb converts only 11 percent of its electrical input into visible light, while the rest is dissipated directly as heat. There are energy costs involved in cooling the studio environment. The measure of Btu/kWh is a means of calculating the thermal loads related to operating lighting. The diffusion frame is secured to the fixture by 4 spring-loaded pins. Align the pins with the oval receptacle holes on the edge of the fixture. The diffusion frame comes with Clips. Cut the diffusion to size and use the Clips to fasten the diffusion to the Frame. The silver louver provides beam control with minimum light loss. Place the long edge of the Louver into the lower channel containing a set of leaf springs. Press down on the Louver and slip the upper edge of the Louver into the upper channel of the fixture. Note: To eliminate multiple shadows, the Silver Louver should only be used in combination with white diffusion. The SnapBag accessory is a lightweight fabric tailor-made for the Image LED fixtures. It slips over the fixture and is attached with straps. The reflective material intensifies the soft light. The removable grid cloth attaches to the inside with Velcro. The SnapGrid accessory is constructed of pre-stretched fireproof fabric with a built-in stainless steel frame. It unfolds and snaps into place. It can only be used with the corresponding SnapBag and is attached with Velcro. It cannot be used by itself. Accessory Barndoors are sold in sets of 4. They are designed so that they can be individually mounted. The Image LED's DMX operate on three DMX channels (in White mode) using DMX512 (six DMX channels in Color mode). The first channel operates dimming; the 2nd channel operates Kelvin color temperature control; the 3rd channel operates the Hue. In Gels/Hue Color mode: 4th channel operates the Gel; 5th channel operates the Hue angle and the 6th channel operates the Saturation. In RGBColor mode, 4th channel operates Red; 5th channel operates Green and the 6th channel operates Blue. The Image LED's DMX include a built-in Lumen Radio receiver and can be operated wirelessly with a Lumen Radio transmitter (sold separately). Wireless is an option to using DMX cables. For more information on Lumen Radio Receiver/Transmitter, see www.lumenradio.com. The Kino Image LED DMX includes state of the art features; dial-in variable color temperature control; full-range dimming without color shift; programmable presets; three menu options, one white and two color menus. The “white menu” gives the user access to Dimming, Kelvin, and Green/Magenta control channels. Kelvin range is from 2700K to 5500K. In the first color menu, the Kelvin range is from 2500K tungsten to 9900K daylight with three additional channels, Gel, Hue Angle and Saturation. The Gel channel includes Kino Flo presets such as blue & green screen, sodium vapor, mercury vapor and over 100 well-known lighting gels. The user can also dial in any color through Hue Angle and Saturation. The second color menu provides individual red, green, blue (RGB) control. This menu is a great way to work with Apps with predetermined RGB presets or color wheels.